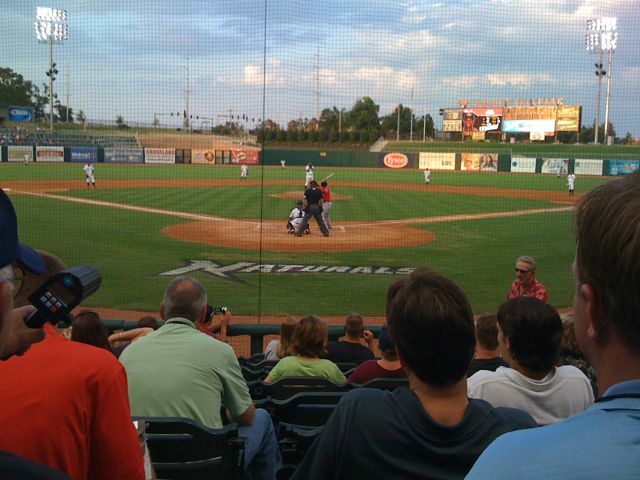 Springdale, AR – Northwest Arkansas Naturals, Texas League affiliate of the Kansas City Royals, and John Lamb (8-7, 2.32) watched one tough inning cost them the second game of the series with the Frisco RoughRiders. I will attempt to stay positive with the first game experience of my son’s first “full” season of professional baseball during his young career. Lamb finished the night after 5 innings of work having allowed 6 hits, 4 runs ( 4 earned runs), 3 walks, 4 strike-outs, 1 home-run and actually lowering his Texas League ERA. His velocity was firm throughout the entire outing despite what appeared to me the challenge of securing his grip on the baseball. The issues are not mechanical on the last four starts by Lamb. Game video by the Northwest Arkansas Naturals. Lamb handed the ball off with a 4-4 tie in the top of the sixth inning to Rowdy Hardy. Hardy was tagged with a single run and the loss before single inning performances by Ben Swaggerty and Enrique Barrera against the Texas Rangers Double-A team. Baseball has always been and will continue to be a game of adjustments for success on the field. Most of those adjustments come from the ballplayer, but not all. Accepting the common denominator of all the Texas League appearances by Lamb and trying something different is long overdue. I proudly saw my son attempt to compete despite digesting questionable calls and serious delays to the tempo of the game with base-runners. I remain confident that my son has not seen the last of his challenges in professional baseball based on the unusual approach of dealing with the root problem. Our family continues to be grateful for the Royals opportunity and hopeful that over analysis will not turn into paralysis on John Lamb. The most saddening thing associated with the evening had nothing to do with the game of baseball, but I will only share with you the fact it occurred after the top half of the fourth inning. The Lamb family wishes the Naturals and Mike Montgomery well tonight as they attempt to win the series on Fireworks Friday. Yeah, the good news is that it’s only four games so far. A lot to learn and I’m confident John will make the adjustments! Couldn’t agree more…four games do not warrant panic, by any means! Whiner… The kid stands on his own or falls. Try not to make his career the one you ‘blew’ away, or never really were going to have. While he has had some success, blaming others for “having allowed 6 hits, 4 runs ( 4 earned runs), 3 walks, 4 strike-outs, 1 home-run” is downright dispicable. Remember, questionable calls have always been and most likely always will be a part of the grand game. Making excuses for “serious delays to the tempo of the game” are not only a tactic used by base runners. Pitchers are known to do the same thing when throwing to first “holding the runner on”, even though the real purpose it to disrupt the timing of baserunners and batsmen. Is a pitcher throwing to first 4 or 5 or 6 times in a row not disrupting “the tempo of the game”? Is a catcher going to the mound several times in one at-bat, followed by the pitching coach, to allow a relief pitcher to warm up, not disrupting the “tempo of the game”? Face facts that no matter how much you try to influence the Royals to see your son in a better light than he himself shines , you won’t. He stands on his own. For better or worse. And just to be clear, as a life long KC resident who has suffered for many years now with the Royals, I hope he wins multiple Cy Young awards someday. While a Royal. Dicso Hayes team mates did not appreciate his blogs either. the whole world is reading. Baseball players have much more important things to concern themselves with…not a blog by a “dad.” Not really worried about the couple hundred that read the site…wouldn’t call that the world! It is clear to me you have some issues, although 11 minutes apart. Wow…first, let me thank you for the visit and comments. Not sure why you think I’m attempting to make excuses for his Texas League appearances, because I AM NOT. I am simply adding my 2 cents regarding “my” perception of the game and recent performances. My son, has always been accountable for his performances and willing to learn from any game changing incidents during his baseball development. FYI…his game changing incident was NOT reflected in this post, nor is it ever likely to be discussed on this platform. Also, our discussions following the game confirmed the common difference of opinions regarding “game changing” events…John and I did not share the same opinion. Glad to know you are a Royals fan…you should be very happy with all the talent throughout their farm system. One thing that really jumped out at me within your disgruntled post…. “trying to influence the Royals to see John in better light”, I dont think the Kansas City Royals organization needs any help what so ever to SEE the light that John Lamb shines when he toes the rubber. Very nice…John controls his destiny, not me or a blog!